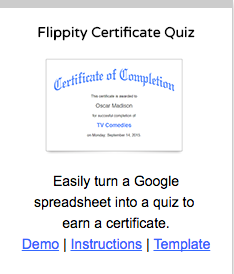 Flippity.net's certificate quiz is a fun way for users to take your quiz that you created and earn a certificate at the completion of getting all the answers correct. An embedded 2 minute and 18 second video is embedded below to show you how to create such a certificate quiz. Everyone likes to feel rewarded - give this site a try!